DJ Derek (born Derek Morris 1942) is a Bristol-based DJ whose blend of 60s rocksteady, reggae, ska, dancehall and soul music has made him an icon for many in the industry, including a host of Jamaican producers and Massive Attack. DJ Derek spent 10-18 years working as an accountant at Cadburys, yet gave it up to play reggae in the St Pauls area of Bristol. DJ Derek pt. 1 from Grand Finale on Vimeo. Derek kindled his love for music as a washboard player in the 1950s and has played popular sets at many major festivals, including Glastonbury and The Big Chill. He MCs in Jamaican Patois while DJing, despite never having visited Jamaica. He picked up the accent from a Bristol based Jamaican barber, and it has since helped him be accepted in the black music industry. In 2006, He released the album DJ Derek Presents… Sweet Memory Sounds, a compilation of some of his favourite tunes. Bespectacled ex-accountant Derek Morris has marked his 67th birthday with one or two discreet little gatherings with fellow music lovers. Or at least, they're discreet and little when you remember that he once had 50,000 revellers leaping about to his discs in Las Palmas, Gran Canaria, and has earned the acclaim of musicians as diverse as Jamaican ska icon Prince Buster and Daddy G of Massive Attack. Some of you must be asking: "Who is this man?" 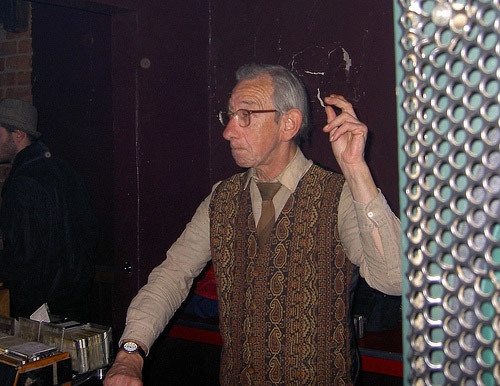 But others, with long memories of the Bristol music scene, will simply think: "Crikey - is DJ Derek still doing his thing?" He is indeed, and he and his trusty haversack are finding it easier than ever to take the train to gigs the length and breadth of the South now that 10,000 of his 52,000 priceless reggae and ska records have been transferred to mini-disc. So many myths surround DJ Derek, the white man who brought reggae to the Jamaican brothers of St Paul's, that it seems time to get back to roots. Working-class white Bristol roots, black immigrant roots, rhythm 'n' blues roots: in this man, all of them seem to intertwine. Derek's earliest memory is of a wartime barrage balloon descending on his family's house near St Andrews Park, off Bristol's Gloucester Road. It was frightening, but his mum saved yards of the balloon's tough fabric, and when he was older he stretched some of it over a cheese box to make his first drum. A few years later, his older brother Gerald would tune into Radio Luxembourg most nights, and sometimes flipped over to the American Forces Network, pumping a pounding beat out of Germany. Most hip kids would be Radio Luxembourg fans - but beyond them, there was a super-breed who kept tabs on all the Afro-Caribbean stuff on AFN. Derek was hooked from the start. As a carpenter's son from inner city Bristol, he could hardly ignore white boys' music, and 1956 found him playing washboard in the Vampires skiffle group, turning to drums when the band switched to rock. Later, he stepped up and drummed for Dale Rivers and the Ramrods - but he was also doing well in his day job in the accounts department of Fry's chocolate works at Keynsham, when suddenly it was make-your- mind-up time. The Bristol duo of Roger Cook and Roger Greenaway, by this time known as David and Jonathan but with their glory years as songwriters still ahead, had said that if they made it, they would take on the Ramrods as their backing group. But at the same time, Derek fell ill with appendicitis - and the lure of a steady job with promotion prospects won the day. Resigned to a life of listening, he found himself gravitating to places in north Bristol that welcomed the new West Indian incomers. "By the mid-Sixties, rock and white R'n'B had given way to beat groups with three guitars and drums," he says. "I missed the sax sound, but could hear it at Tom Phelps's Embassy Cafe, and then the Criterion he took over in Sussex Place. "Then there was the Bamboo Club in St Paul's, where I first heard the likes of Desmond Dekker, Toots and the Maytals and early Bob Marley. Some people thought hanging around the Bamboo was dangerous for me, but the guys there knew I was only there for the music." Then more drama: "I gave up my job at Fry's in 1977, after five years of domestic hell in which I went through two marriages and lost both of my parents. "I went on the dole and was on the verge of a nervous breakdown when a Jamaican bus driver I knew took over the Star and Garter in Montpelier and asked me to bring some of my records in to play for beer money. He knew I had something for everybody." And that was the start of it all - including years, early on, when Jamaicans new to him were appalled to find a white man at the turntable. "Just wait till da man plays," wiser heads told them, and now no self-respecting follower of ska and reggae in Britain, whatever their colour, would admit to not knowing DJ Derek. Far from a flamboyant man, he can hold a crowd of 50 to 50,000 in the palm of his hand simply through his music, and takes huge pride in gauging the mood of the audience. He tells of a night when the main act failed to show and he had to keep 500 people entertained from 8pm until 2am. "After about four numbers they were flagging a bit," he says. "For some reason I put on Eddie Lovett's Gypsy Woman, they came flocking back, and I knew I'd got 'em! "For the rest of the evening, people were asking me for records I'd already got lined up and ready to go. It sent a chill down my spine, it was uncanny - and it told me that this was something I could do, and will keep on doing till I drop dead over the decks." Bristolian as they come, at the turntable he sounds as if he's just stepped off the plane from Kingston. Living his professional life in a black man's world, he started using the patois as the only realistic way of communication, on the phone in particular - and now it rings completely true. Which is as it should be. There's nothing remotely fake about DJ Derek and his passion for Jamaican music - and who knows, he might even get to visit the place, one of these days.